1. Cruises to St. Lucia from Florida are always popular, and the Celebrity outing is no exception. This 14 night cruise also includes stops in Charlotte Amalie, Philipsburg, St. John’s, Bridgetown, St. George’s, Aruba and Curacao. 2. Princess Cruise Lines 15 night odyssey is another of the great Fort Lauderdale cruises with stops in Aruba, Colombia, the Panama Canal, Costa Rica and Guatemala before you disembark in Los Angeles. 3. How does a transatlantic crossing sit with you? Celebrity offers a 12 day crossing with stops in Portugal, France and Belgium before you head to the final port of London England. 4. If cruises to Barbados from Florida are what you are looking for, look no further than the Princess offering that also includes stops in lovely Antigua, St. Lucia, St. Kitts, St. Thomas and Grand Turk. 5. Carnival Cruise Line offers an 8 night adventure to the Caribbean, just one of the cruises to Aruba from Florida you can find with their cruise that also makes Grand Turk, the Dominican Republic and Curacao ports of call. 6. For a grand tour, perhaps the Holland America 31 night adventure is what you are looking for. This Fort Lauderdale cruise lands in London England, but not before you visit Bermuda, France, Belgium, Denmark, Germany, Estonia, Russia, Finland and Sweden, bringing you the best of Europe in one ‘unpack once’ trip. 7. 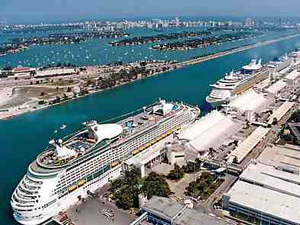 Bahamas cruises from Ft Lauderdale are popular because of the vicinity of the two destinations. Princess Cruises have roundtrips that visit their Bahamian island of Princess Cays, Curacao and Aruba in a 7 day trip that is sure to delight. 8. Royal Caribbean’s 4 night trip to Cozumel allows you plenty of time to take in the culture and white sandy beaches of this Mexican hotspot, and is a mini getaway to the sun perfect for the novice or seasoned cruiser. 9. Also from Royal Caribbean’s cruises from Fort Lauderdale is a longer trip, this time 17 days that ends in Copenhagen. Visit such ports as Ponta Delgada, Cork, La Havre, Zeebrugge, Amsterdam and Oslo on this magnificent adventure. 10. How about a Caribbean Hideaways tour? Seabourn has a 10 day adventure to lesser traveled places in the Caribbean like San Juan, Prickly Pear Island (Antigua and Barbuda), Basseterre (St. Kitts/Nevis), Great Harbour in the British Virgin Islands and Samana in the Dominican Republic. Fort Lauderdale cruises can bring the world to your doorstep. What are you waiting for?